Volunteers from the Umhlanga Lifesaving Service in South Africa spent nearly three hours in the water holding up a bottlenose dolphin, which was spotted in difficulty 25 metres from the beach in front of the Pearls development in Umhlanga on Sunday morning. 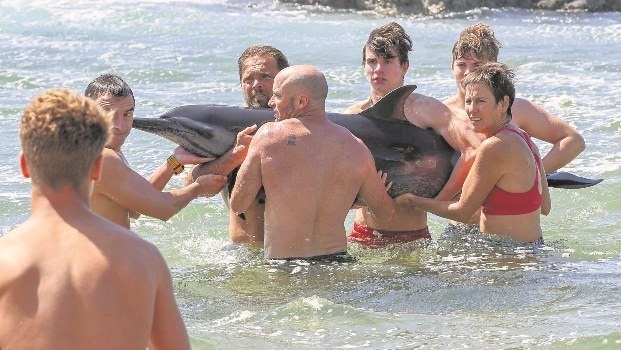 Declan Bradfield, Carl Tostee, Dylan Olivier, Simon Vickers, Paul Herbert, Nick Horn, Wendy Horn and Derick Morris moved the dolphin, which appeared to be disoriented, from the rougher open water to Granny’s Pool, where they were able to help it stay afloat. Craig Lambinon, spokesperson for the NSRI, said the organisation’s units in Ballito and Durban were called by the KZN Marine Animal Stranding Network to assist with transporting the dolphin out to sea to release it in the vicinity of a dolphin pod. “On the NSRI’s arrival on the scene, Umhlanga Lifesaving lifeguards had arranged with a private charter company to use their private craft to transport the dolphin out to sea,” he added. The dolphin was lifted by the lifesavers, under the supervision of Kelly de Klerk from uShaka Marine World, onto a rubberduck owned by Casea Charters and skippered by Kit Case. Once out at sea, the lifeguards assisted with doing float and swim tests to make sure the dolphin was fit to be released. “Once released, the dolphin appeared to take a few moments to acclimatise following the boat ride but soon appeared to swim away strongly towards a dolphin pod,” Lambinon said.